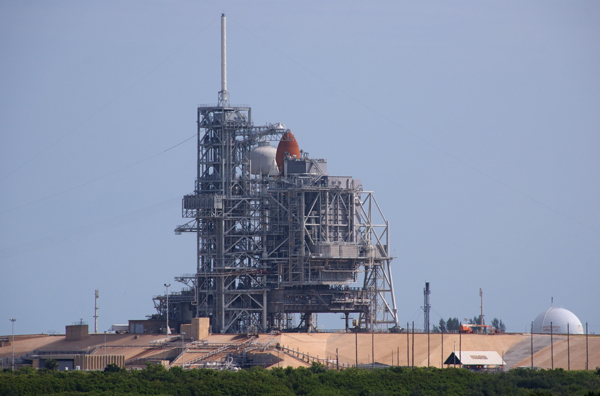 I created a panorama of the shuttle launch pads from the viewing platform. It's eight photos stitched together in Photoshop, but it's a poor job because I didn't have the camera on a tripod. Click on the image for a bigger version. 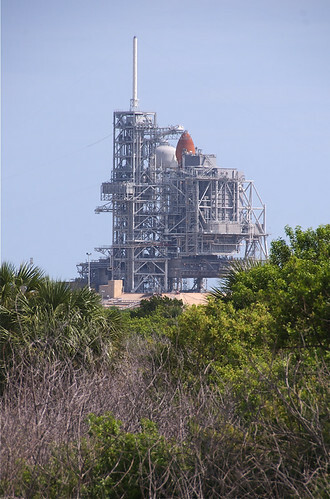 Shuttle Atlantis on launch pad 39A. You can just see the top of the external fuel tank and the twin solid rocket boosters. I took advantage of NASA's salute to Brevard County residents by getting free admission to Kennedy Space Center on Sunday. Tickets are usually $38 each, so it was a good deal. I took a bus tour of the expansive grounds and saw two shuttles on their respective launch pads. It was supposed to be the last time there would be two shuttles ready to launch. But because Atlantis' mission to the Hubble Space Telescope has been postponed, it probably will happen again in February. When servicing the Hubble, NASA needs a backup shuttle ready to go in case it needs to mount a rescue mission. Here are some more photos from KSC. Endeavour is on 39B to the left and Atlantis is on 39A to the right. 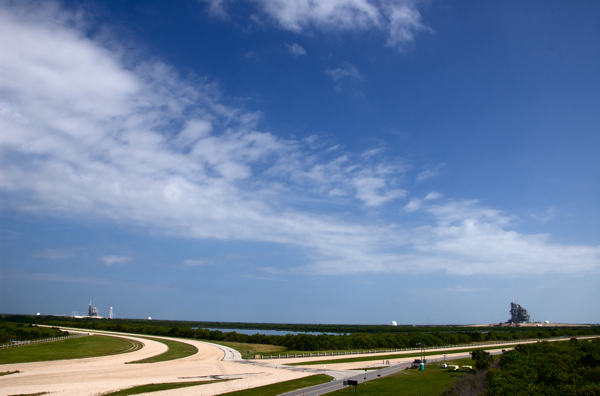 A view of Atlantis over the brush in front of the launch viewing complex. It would be great to witness a launch from here. It's quite difficult to get tickets, though. 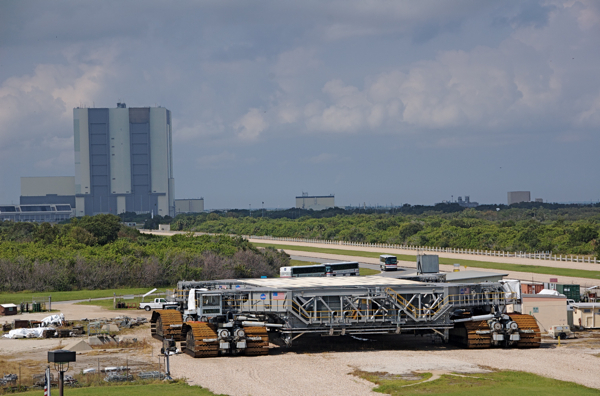 The crawler that transports the shuttles from the Vehicle Assembly Building in the background to the launch pad sits near the viewing platform. A steady stream of tour buses travel the road behind it. Each cleat in the tracks of the crawler weighs a ton. 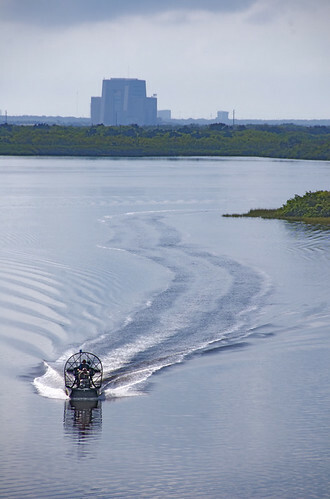 The grounds of KSC are maintained by the Interior Department. I think this airboat contains wildlife officials. 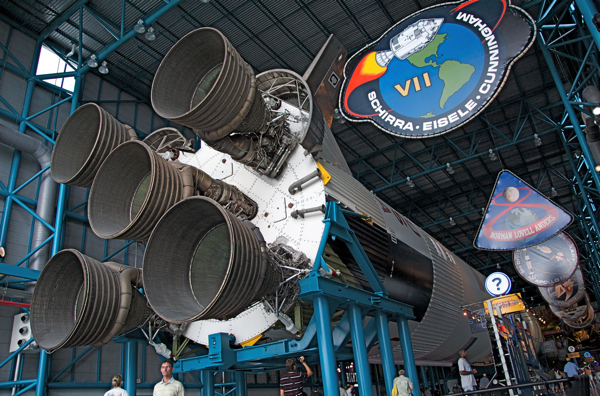 Here's a Saturn 5 rocket on display at The Apollo/Saturn V Center. It's a monstrosity, which makes me excited for the upcoming Constellation program and its large Ares rockets. They will be spectacular launches. 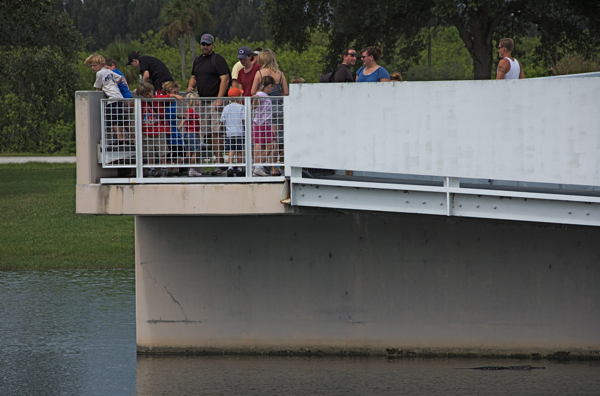 Visitors look for alligators in a pond near the astronaut memorial. They couldn't see the gator lurking beneath the overhang, but I could. 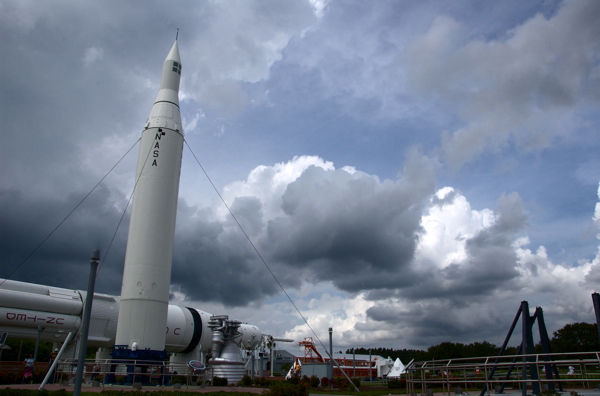 The rocket garden has a collection of retired rockets.